And my apartment doesn't have air conditioning yet! For the past two days, it's been a game of "Let's see who gives out first, me or my ancient laptop?" Today I'll be all educated and cultural and smart-like at the Global Gateways & Local Connections conference, in air-conditioning. Since we've made it through the heatwave, I believe it's the best day for ice cream sandwiches. 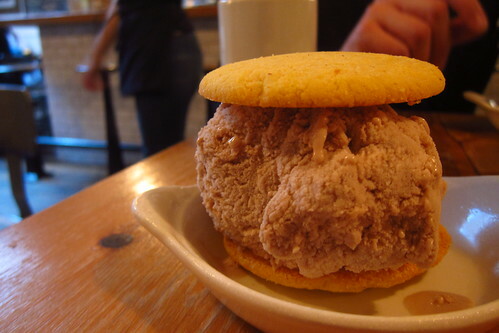 This is one I had at The Meatball Shop; it's strawberry balsamic and corn cookies. Delicious. Have a good weekend, folks!